OK, you an American traveling the planet? 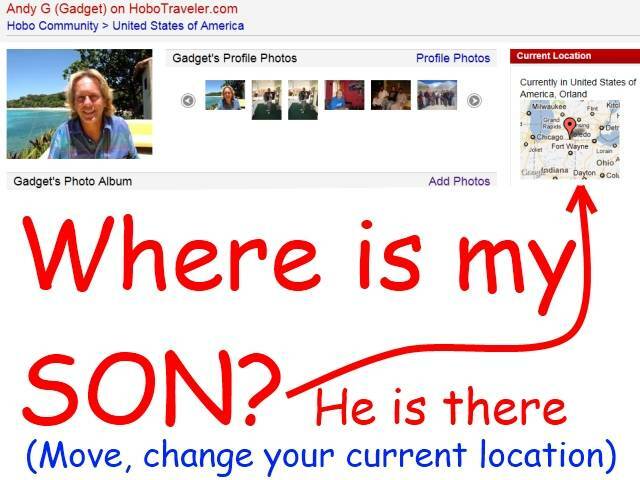 How can you let your friends continuously know where you are at, HoboTraveler.com members now can with a map. Andrew the chief coder for HoboTraveler.com today added a truly cool feature for members of the Hobo Travel Community to use. By updating your profile, you can tell friends the exact city where you are located, as you travel around the USA or world. This is a feature I have always wanted for my family and friends, being that I am a real traveler, this made me real happy. I try to avoid the question, where are you? There is a HUGE need for Tourists or Travelers to tell family where they are located for safety reasons. For example, the USA government has a way to let people register with the Embassy where that you are in a country. However, a savvy person knows better than to tell the USA government anything, anything you tell them, can and will be used against you. This does the same, but is easier. 1. Your children update their profiles, the map and city changes. 2. The parents can go to the profile from any Internet anywhere and check the map daily. 3. OR --- HoboTraveler.com can send an e-mails to people who need to know, we can add this feature in the future. For about two years, my Travel Blog has a feature like this, and a map. Sometimes a close friends would say, where are you at? Hehehe, I know they are not reading my Blog --- too funny sometimes. Now all members of Hobo can have this same map feature, too fun. Sign up today, or cajole your daughter and son into signing up, this feature will only get better, and more fun to use. Do not worry, this is not the exact location, just the city, for your privacy and protection. Did you know? You can back up all your photos on HoboTraveler.com for free, and file them by city where the photo was taken?